What are the times of the school day? There are six, 50 minute periods during the day. This is designed to maximise the learning experience of all students across a broad curriculum. The day begins at 8.30am and finishes for all students at 3.00pm. Throughout the school year, there will be a range of after-school clubs and lessons available for students, especially those sitting public examinations. The school library is also available for students after school on most days of the week. How can I get involved with the school? 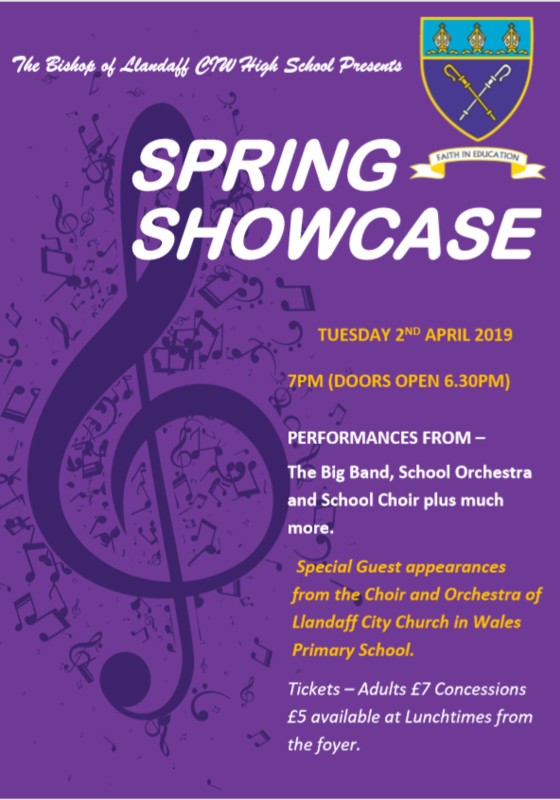 There are a variety of ways to get involved including: attending various sporting, musical and liturgical performances; regularly visiting the school website and following us on Twitter. We welcome feedback via email, letter or in person too. Who is the best person to contact with general questions about my child? Your child's form tutor and head of year are the primary points of contact. If your concern is about school or more than one subject, we would recommend you speak to the tutor and then head of year. If you are still concerned then we would recommend you speak to one of the leadership team assigned to specific key stages: Mrs Bowen Jones (Years 7 - 9); Miss Parry (Years 10 - 11); and Mr Gardiner (Sixth Form). If your concern relates to a subject, then we would recommend the first point of contact being the class teacher, then head of department. In some smaller departments we also have heads of faculty who are here to help. I’m concerned that my child is unhappy – who is the best person to talk to? In the first instance, the person to contact would be Mr Davies, chaplain. He will be able to discuss any concerns. Form tutors, heads of year/school are also available but as a non-teaching member of staff, Mr Davies is available throughout the day to support students and ensure they are happy during their time at school. What if I have a query about uniform? Please call the main office or the pastoral team and they will assist you with any queries. If you are unsure about purchasing the correct uniform, then please see our Uniform Expectations Guide which is designed to provide clarity on our expectations. What if my child’s shoes break? Please send your son/daughter into school and the pastoral team will provide a spare pair for his/her use until you are able to purchase a new pair. What if my child has lost or forgotten his/her tie? Your son/daughter can go to the pastoral office and borrow a tie for the day if they have forgotten or lost their existing one. New ties can be purchased at the main school office for £5.00 for a short tie and £7.00 for a large. What is a 'Pink Slip' Day? We have high expectations of uniform as we believe it sets the tone for learning. Periodically, we use 'Pink Slip' Days to reinforce our expectations. Where students do not meet these then they will receive a sanction. We ask for your support with this. Will the school contact me if my child doesn’t arrive at school? Yes. Mrs O'Reilly, our Attendance Officer, closely monitors attendance, and will contact you by phone or text if your child is absent and you have not called in. Please make sure that your contact details are up-to-date. You can contact the school office with any change of contact details on 029 20562485.
Who do I tell if my child needs to be absent from school for a medical appointment? Please contact Mrs O'Reilly, Attendance Officer on 029 20562485 or email angele@bishopofllandaff.org if your child is going to be absent from school. Please be aware that medical evidence may be requested for prolonged absence. My child has broken his/her leg – what should I do? Once your child is ready to come back to school after an injury, we will make necessary arrangements to ensure that he/she can continue to learn at school in a safe environment. We will undertake a risk-assessment with you to ensure you are content with the arrangements in place. Please feel free to call the main office to discuss further. What if I want to take my child on holiday during term time? Students are expected to attend school for 190 days of the year. We expect students to have strong attendance and not below 95%. Attendance below this seriously jeopardises a child's educational attainment. The school does not authorise family holidays during term time. When should my child arrive to school? Your child must be in school by no later than 8.30am. Will I receive a home visit from the school if my child is persistently absent from school? Yes, perhaps even if you have phoned in. This is intended to be a supportive measure. How can I find out what level/class my child is streamed into? Please attend Parents’ Evenings regularly, and contact individual teachers for up-to-date information. Dates for Parents’ Evenings can be found on the school calendar. Is it okay to email teachers directly? Yes. There is a link on the school website that will allow you to do this. We aim to respond to emails within 24-48 hours. If you have not heard from a member of staff in this time then please do contact the main office. What if I am concerned about my child’s academic progress? Please contact your child’s teacher, subject leader or pastoral manager to arrange a meeting to discuss any concerns. How will I know if my child receives a detention? The school will contact you by text, phone and/or email if your child receives a detention for more than 15 minutes (or after-school detention). Please ensure your contact details are up-to-date to avoid any issues with communication. You can contact the school office with any change of contact details on 029 20562485. I’d like to discuss my child’s behaviour outside of school – who is the best person to speak to? The pastoral team are available to discuss any queries you may have and can direct you to the person most suited to support. Please be aware that we sanction students for misbehaviour outside of school and outside school hours. After School Clubs – does my child have to attend every week or can they drop in? Your child is welcome at after-school clubs whenever they want to attend. However, some extra-curricular activities such as school performances may require committed attendance to avoid letting others down. A copy of the numerous lunchtime and after-school clubs are available on our website. How much homework should my child receive? We aim to set students in key stage 3 (Year 7, 8 and 9) at least one piece of meaningful homework each night. In key stage 4 (Year 10 and 11) there is usually one/two pieces per night. However, this will vary at more demanding times in the school year. In addition to this, all students have a reading book and we encourage them to spend around 15-20 minutes reading each day. Sixth Form students are expected to use their independent study sessions as well as wider reading to support their learning, as well as completing formal homework set. Who do I contact about homework? Please contact your child’s teacher to discuss any homework queries. If you have broader questions about homework then please raise these with Mr Hughes, Assistant Head. How do I apply for my child to attend The Bishop of Llandaff in Year 7? For admissions into Year 7, parents/carers are required to complete an application form by the specified deadline. The governing body is responsible for admissions and applies oversubscription criteria in the event that there are more applications than places available. Who should I contact about my child’s additional learning needs? Please contact your child’s teacher to discuss queries around your son/daughter’s additional learning needs. Alternatively, please contact our Head of Inclusion, Miss Dolan, for queries regarding provision available or your child's specific needs.